German researchers develop a way to equip mouse hematopoietic (blood) stem cells with a fluorescent marker that can be switched on from the outside. Using this tool, they were able to observe, for the first time, how stem cells mature into blood cells under normal conditions in a living organism. In the bone marrow, hematopoietic stem cells (HSCs) give rise to a large variety of mature blood cells via progenitor cells at various stages of maturation. Now, scientists at the German Cancer Research Center (DKFZ) say have developed a way to equip mouse HSCs with a fluorescent marker that can be switched on from the outside. Using this tool, they were able to observe, for the first time, how stem cells mature into blood cells under normal conditions in a living organism. With these data, they developed a mathematical model of the dynamics of hematopoiesis. The researchers have now reported in the journal Nature that the normal process of blood formation differs from what scientists had previously assumed when using data from stem cell transplantations. From ancient times, humankind has been aware of how important blood is to life. Naturalists speculated for thousands of years on the source of the body's blood supply. For several centuries, the liver was believed to be the site where blood forms. In 1868, however, the German pathologist Ernst Neumann discovered immature precursor cells in bone marrow, which turned out to be the actual site of blood cell formation, also known as hematopoiesis. Blood formation was the first process for which scientists formulated and proved the theory that stem cells are the common origin that gives rise to various types of mature cells. "However, a problem with almost all research on hematopoiesis in past decades is that it has been restricted to experiments in culture or using transplantation into mice. 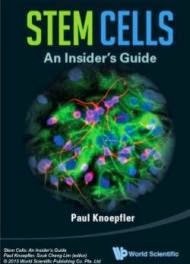 We have now developed the first model where we can observe the development of a stem cell into a mature blood cell in a living organism." says Professor Hans-Reimer Rodewald from the German Cancer Research Center (Deutsches Krebsforschungszentrum, DKFZ). Dr. Katrin Busch from Rodewald's team developed genetically modified mice by introducing a protein into their HSCs that sends out a yellow fluorescent signal. This fluorescent marker can be turned on at any time by administering a specific reagent to the animal. Correspondingly, all daughter cells that arise from a cell containing the marker also send out a light signal. 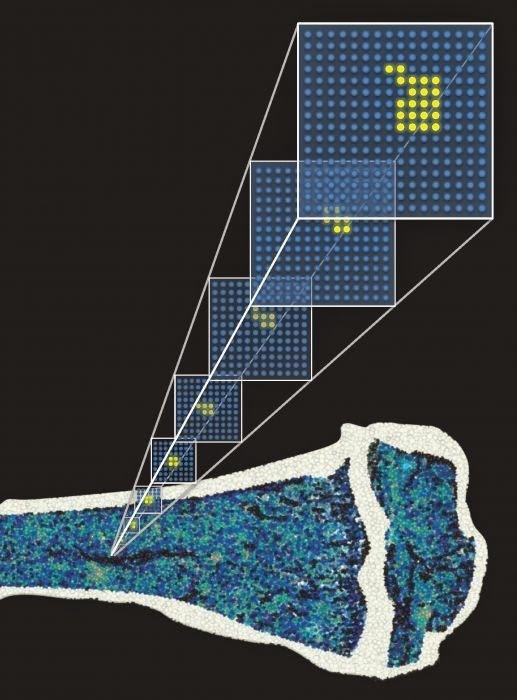 Blood stem cells in the bone marrow have been labeled with a fluorescent marker protein. blood formation, which can provide new insights into the behavior of stem cells. When Busch turned on the marker in adult animals, it became visible that at least one third (approximately 5000 cells) of a mouse's hematopoietic stem cells produce differentiated progenitor cells. "This was the first surprise. Until now, scientists had believed that in the normal state, very few stem cells -- only about ten -- are actively involved in blood formation." said Busch. However, it takes a very long time for the fluorescent marker to spread evenly into peripheral blood cells, an amount of time that even exceeds the lifespan of a mouse. Systems biologist Prof. Thomas Höfer and colleagues (also of the DKFZ) performed mathematical analysis of these experimental data to provide additional insight into blood stem cell dynamics. Their analysis showed that, surprisingly, under normal conditions, the replenishment of blood cells is not accomplished by the stem cells themselves. Instead, they are actually supplied by first progenitor cells that develop during the following differentiation step. These cells are able to regenerate themselves for a long time -- though not quite as long as stem cells do. To make sure that the population of this cell type never runs out, HSCs must occasionally produce a couple of new first progenitors. During embryonic development of mice, however, the situation is different: To build up the system, all mature blood and immune cells develop much more rapidly and almost completely from stem cells. The investigators were also able to accelerate this process in adult animals by artificially depleting their white blood cells. Under these conditions, HSCs increase the formation of first progenitor cells, which then immediately start supplying new, mature blood cells. In this process, several hundred times more cells of the so-called myeloid lineage (thrombocytes, erythrocytes, granulocytes, monocytes) form than long-lived lymphocytes (T cells, B cells, natural killer cells) do. "When we transplanted our labeled blood stem cells from the bone marrow into other mice, only a few stem cells were active in the recipients, and many stem cells were lost. Our new data therefore show that the findings obtained up until now using transplanted stem cells can surely not be reflective of normal hematopoiesis. On the contrary, transplantation is an exception [to the rule]. This shows how important it is that we actually follow hematopoiesis under normal conditions in a living organism." Rodewald explained. The scientists in Rodewald's department, working together with Thomas Höfer, now plan to use the new model to investigate the impact of pathogenic challenges to blood formation: for example, in cancer, cachexia or infection. This method would also enable them to follow potential aging processes that occur in HSCs in detail as they occur naturally in a living organism.